My family loves pickles very much. We don't really like sweet pickles, mostly we prefer sour or sour/spicy pickles. The Pickled Pantry: From Apples to Zucchini, 150 Recipes for Pickles, Relishes, Chutneys & More is more than just a cookbook, it's a primer about pickles. If you've only made a few types of family recipes of pickles, or have never made pickles before, you'll probably learn a lot just reading this volume. If pickles were a college course, this would be the text book for Pickles 101: What are pickles? The next classes would cover regional recipes in depth, and how pickles are served. It covers various pickling methods. Fermented, hot pack canned pickles, and refrigerator pickles are all discussed with recipes. The book starts with an overview of pickling methods, supplies and techniques. There is a lot of information in it and it shouldn't be skipped. 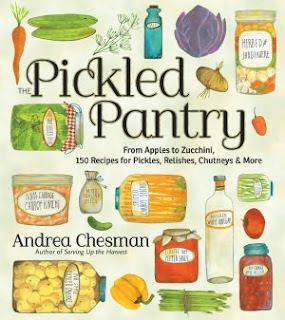 It includes information about pickling spices, canning and a bit of the history of pickles. There is also a great chart for figuring the total volume of produce by weight. Each chapter starts with a more in depth look at the technique and uses for the types of pickles made. Lacto-fermented pickles are made by creating a brine, and allowing the pickles to ferment and develop lactic acid for sourness. It's a very traditional way of preserving produce, and creates a wonderful flavor. Before even getting to the recipes, she introduces my favorite author on the subject of fermented foods, Sandor Ellix Katz, the author of Wild Fermentation. He explains the methods he uses, and talks about how much he loves pickles. The recipes start with dill pickles, then go into things like different variations of pickled cabbages, such as kimchi and sauerkraut. There is also a recipe for a classic Tabasco like hot sauce. Single jar pickles is exactly that. Small recipes perfect for quick canning. Again, there are several recipes for America's favorite, dill pickles. Then there are a bunch of vegetable pickles. Pickled beans, carrots, and even pears for a sour-sweet addition to meals. This is the chapter for people who love farmer's markets or have small gardens. Big Harvest Pickles is the chapter for large harvests or fantastic deals on produce. These recipes make a lot of pickles to put up or give away as gifts. There are recipes for pickled apples, older recipes like Overnight Sunshine Pickles which uses overripe cucumbers to get the most of your harvest, and dilly beans. Most of the recipes call for a few lbs of produce. The notable exception is pickled watermelon rinds which calls for the rind off on watermelon to make 6 pts of pickles. Nice variety for different kinds of gardens in this chapter. Salsas, Relish and Chutneys are the spreads and dips of the pickle world. Lots of sweet chutneys, like the one made with rhubarb, some sauces that combine produce with vinegar, and salsas. Refrigerator and Freezer Pickles is my second favorite chapter (Fermented pickles is my favorite)- these are the very quick recipes that age in your fridge or freezer. The advantage to them in a hot summer is obvious. They don't need to be canned. A lot of them are made very simply by pouring a brine over the produce then chilling. If you are lucky enough to have a large freezer, the recipes that can be frozen make a tasty way to save some summer flavor. This chapter also has a great variety. Pub-style pickled onions to Asian inspired recipes like Vietnamese-style pickled daikon and carrots. This is the nearly instant gratification world of pickles. You can eat a lot of these after they've been in the fridge overnight to develop flavor. The recipes chapter proves that pickles go beyond sandwiches and cocktails. Creamy Dilled Smoked Fish uses smoked salmon, pickles and pickle juice for lots of flavor. There are a few main courses, some good lunches, lots of side dishes and a German Sauerkraut Chocolate Cake recipe. The author swears you don't taste the sauerkraut. It's a wonderful book, and one I really recommend.